Here's a recipe for making delicious garlic mashed potatoes sweet and mellow with none of that raw garlic harshness. 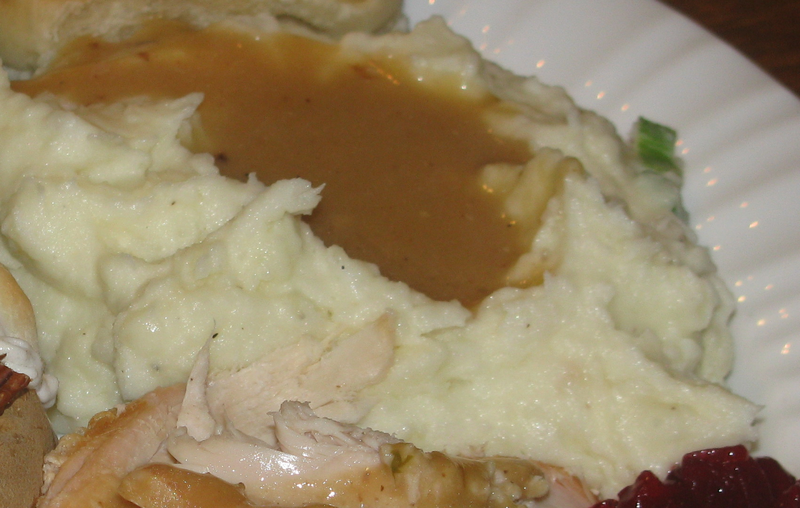 Most mashed potato recipes call for cream, half-and-half, or milk. This recipe is so good and creamy you don't need any cream in the mix or gravy on the table.... When I make mashed potatoes I�ll use my handheld mixer. I guess mine would be kind of whipped mashed potatoes. I like using the handheld mixer because I can get smoother mashed potatoes. Potato croquettes make tasty hors d'oeuvres. Gnocchi is easy to make: Add flour and an egg yolk to bind and olive oil for smoothness. Slice long snakes of dough into tiny dumplings, and roll them off the back of a fork.... During Thanksgiving, that most divisive of holidays, mashed potatoes are perhaps the most divisive side dish of the lot. I like mine to be rich, perfectly smooth, and creamy with plenty of butter and heavy cream, loaded with black pepper, maybe some chives if I want to feel extra fancy. I make sure the potatoes are quite tender then boil down the water more, pulling the potatoes to the center of the pot. There will be some nice thick potato broth in there. Mash with a masher; they are quickly creamy and fluffy. Add cream if desired, but these potatoes are already delicious. When I make mashed potatoes I�ll use my handheld mixer. I guess mine would be kind of whipped mashed potatoes. I like using the handheld mixer because I can get smoother mashed potatoes. FOR THE POTATOES: Place potatoes and two pinches of salt in a pot of cold water, cover and bring to a boil. When water is boiling lower heat, and simmer till potatoes are tender (about 25-30 minutes). Drain the potatoes and garlic and return to the pot over high heat. Cook, tossing the potatoes, for 1 to 2 minutes, or until all the moisture is evaporated. Transfer to a large bowl and mash with a potato masher. Potato croquettes make tasty hors d'oeuvres. Gnocchi is easy to make: Add flour and an egg yolk to bind and olive oil for smoothness. Slice long snakes of dough into tiny dumplings, and roll them off the back of a fork.